Since we moved to Alabama and I finally decided to try out Aldi, I have been in love. Of course, it’s not as convenient as my Walmart Grocery Pick-Up, but the price makes it irresistible. It’s almost impossible to fill up a grocery cart for less than $200, but Aldi never disappoints me. The key to staying on budget in the food department is large family meal planning, so that’s what I’ve been doing the last several weeks. 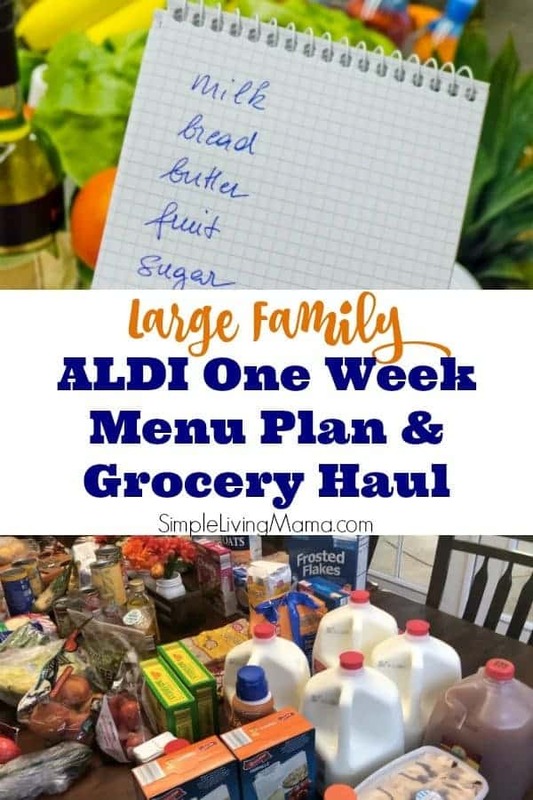 Today, I’m excited to share with you my large family ALDI one week meal plan AND grocery haul. Before I jump into the haul, let me talk about my meal plan. I’ve been following along with the Mash-Up Mom for the last few months and it’s been well worth my time. She posts a weekly Aldi meal plan and grocery list. Her meal plans typically feed a family of four and are under $60 for one week’s worth of dinners. Since we are a large family, I can usually double her recipes. I don’t always double everything since most of my kids are still little, but most of the time I do have to double the meat to make sure everyone is fed. Of course, her meal plans don’t cover breakfast, lunch, or snack so I add those in myself. I’ve had fun trying several of her recipes, and I fill in with recipes from my master meal list for things I know my family won’t eat. I also try to keep my pantry stocked with everything on my master grocery list. If you’ve been following along for some time then you know I used to do once a month grocery shopping. I loved it and it is so convenient. In this season of life, I just haven’t had the budget to do a huge once a month grocery shop and to get into that habit again. Both Walmart grocery pick-up and the fact that Aldi is so less overwhelming to me have made weekly grocery shopping not as overwhelming as before. I do not specifically plan breakfasts, lunches, or snacks. I just make sure to always have items available. The kids can choose from cereal, oatmeal, eggs, or yogurt for breakfast. I do purchase one bag of popcorn chicken for one lunch for the kids. We always have items for sandwiches, including tuna sandwiches once a week. Snacks are granola bars, fruit and vegetables, popcorn, and lately we’ve been baking a lot of desserts. I usually make chocolate chip cookies, peanut butter cookies, and brownies once a week for a sweet treat. This week we spent about $170 at Aldi. I can usually get by with spending $150 or less, but we went as a family and piled in more snacks than usual. Of course, we had several things at home, so I don’t have to re-buy everything we need every week. Do you shop Aldi? What’s on your meal plan this week? Yes, they have been a lifesaver!